Bonus: Bonuses: 15% discount when invest in first hour. 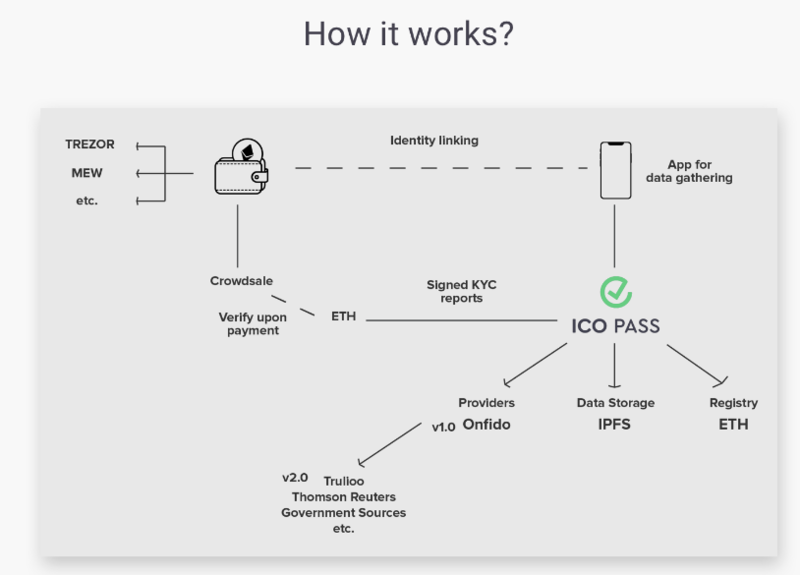 ICO Pass is a suite of tools for the gathering, verification and exchange of know-your-customer (KYC) information. The target audience are tokensale organizers on the Ethereum blockchain. This information is verified against multiple backing providers (initial version uses Onfido), then it is signed with an ICO Pass key (0x612fadf295ce8bbbcf83ecd5dc2832b5ace583e3), encrypted against the public crowdsale address, and published to IPFS. For tokensale organizers, ICO Pass provides smart contracts with modifiers to verify sender address on time of payment, and a web-application to access and manage the gathered KYC information. No sign-up or up-front work is required. For contributors, ICO Pass publishes a mobile application, which facilitates the gathering of KYC information. Contributors will prove their address ownership via small token ethereum transfers, which will be refunded (minus the network fees). While legally KYC checks are increasingly more important, there are many ICO organizers that choose the path of the least resistance (and don’t gather KYC information at all). So one of the end goals of ICO Pass is to enable KYC verification as easily as possible for the ICO organizers. Additionally, KYC verification does not guarantee that the ICO organizer will be able to get in touch with the contributor. 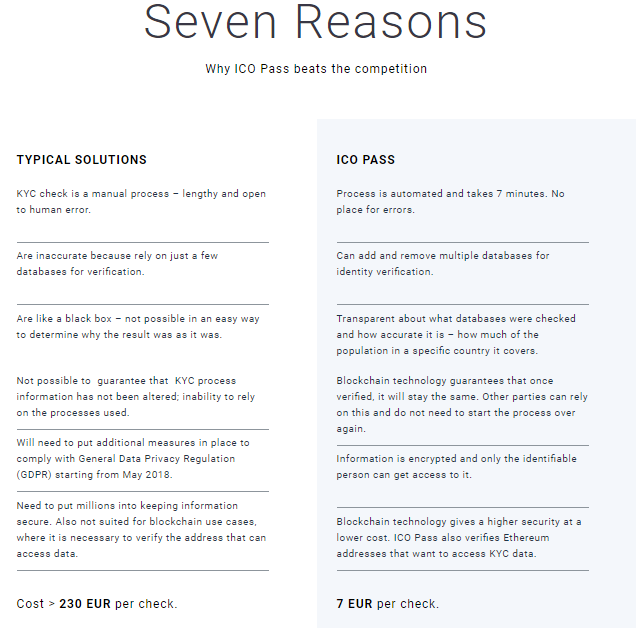 Should a bank, or a regulatory agency ask for more information regarding a specific contributor, ICO Pass aims to have a way to allow ICO organizers to get in touch with the contributor. Even with contact information and KYC information available, there is the matter of tooling. There are no KYC management systems that can interact with blockchain-based data. Also, different ICOs use different smart contracts to manage their crowdsale. Often crowd sale contracts are audited, and may not be easily changed. — enabling contributor verification should be simple – ideally with no more than just a Solidity function modifier. This should ease auditing constraints. — additionally, a proxy contract can be deployed to forward only verified funds.However, since an audited crowdsale would have to audit the whole setup, thena proxy contract does not offer significant advantages over a Solidity function modifier. Initially ICO organizers who would adopt the ICO Pass, would have to trust the ICO Pass verification key signatures – because there would be no other verifiers. However, in theory, new verifiers could appear and submit information about ethereum addresses. — a webservice for interacting with the mobile application, and signing the KYC information gathered with the ICO Pass mobile application. The mobile application will be open-sourced after the ICO Pass crowdsale. At no point will it ask for private keys from the end-user. The webservice, which performs KYC verification and submits signed information to the blockchain, will not be made open-source initially. Formally, ICO Pass only supports Ethereum addresses. However, cryptocurrencies that use the same elliptic curve for its user keys should be verifiable as well. 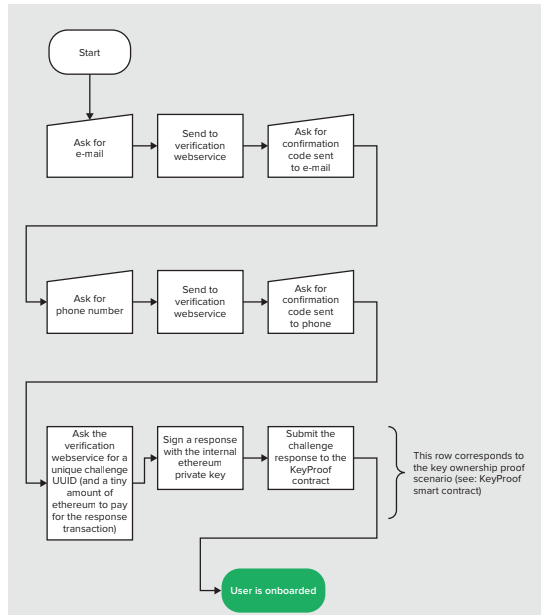 ICO Pass currently does not support smart contracts for contributor verification on non-Ethereum platforms. It has not been tested with Counterparty. 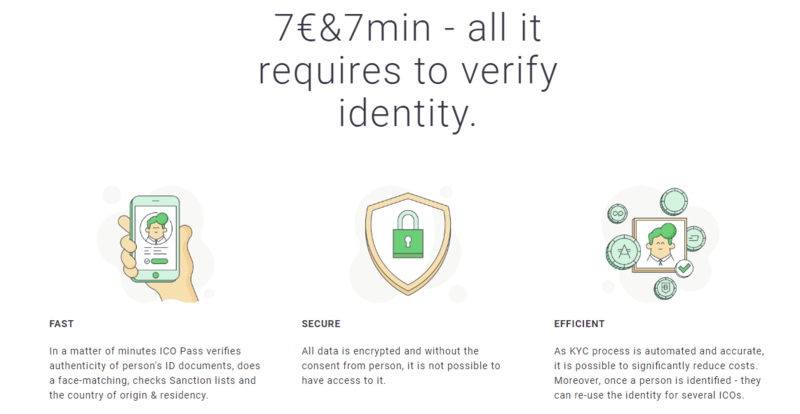 In a matter of minutes ICO Pass verifies authenticity of person’s ID documents, does a face-matching, checks Sanction lists and the country of origin & residency. As KYC process is automated and accurate, it is possible to significantly reduce costs. Moreover, once a person is identified – they can re-use the identity for several ICOs. ICO launch. Product launch. Technically: validate that the owner of an Ethereum wallet has passed an ID background check stating that they are not part of a restricted set of users (e.g. US citizen or individuals on official watchlists). The background check is run via a third party, namely Onfido. The ICO Pass team has set up a smart contract system to record the outcome of the background check on the public Ethereum blockchain, i.e. whitelist Ethereum addresses that are owned by non-restricted users. Legal point of view: doublecheck with all the regulators in different countries how to even more effectively meet their requirements. Business: attract first ICOs from Europe. New databases are added for higher accuracy. ICO organizer communication tool added for contacting ICO contributors. Integration with US State Revenue Service or Banks to automatically determine if the investor is accredited. First US based ICO. Integration finished with Banks who in EU are providing their APIs under PSD2 regulation. Automatically determines if the person is accredited investor.